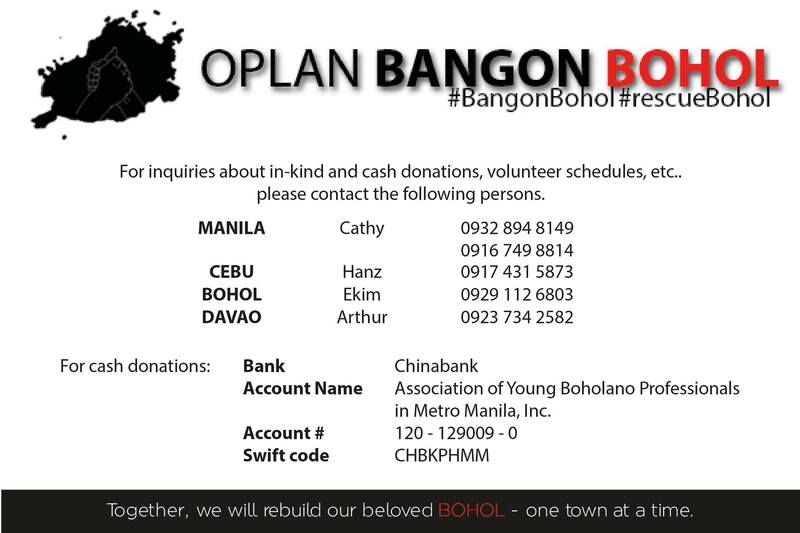 It’s now been ten days since Bohol’s tragic earthquake in which at least 198 people have died, both within and beyond the island. I watched the tragedy unfold on social media from a safe distance and after ascertaining that all my friends and colleagues are safe I’ve had space to reflect on how the tragedy is being processed by Boholanos. We have all become accustomed to the truism that social media is well suited to disaster situations when—constraints on electricity and networks notwithstanding—individuals can share vital information in a way that is fast, relevant and decentralised. 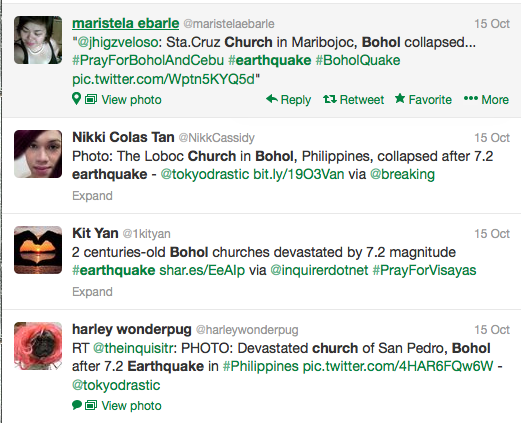 But as an outsider I was baffled, and a little angered, by how Filipino social media became saturated with images of ruined churches and desperate appeals for prayer. I couldn’t help being left with the impression that an almost hysterical cycle of conspicuous piety was drawing attention away from more pressing human needs. Which towns and villages were most affected? What roads and bridges were still open? Where were resources, money and volunteers needed? This information is now easily found and my frustration has eased. In the meantime I’ve had space to reflect on why it was that ruined churches became such an appealing symbol of the earthquake. For Boholanos, Spanish-era churches evoke powerful and complicated feelings. As an early site of Spanish evangelisation, many of Bohol’s churches are at least twice as ancient as the oldest structures in Australia, and a local but thoroughly false legend has it that the Baclayon church is the oldest in the Philippines. But age is only part of the equation. Spanish missionaries were obsessed with building churches and their fanaticism exacted an enormous toll on the population. Bohol’s subjugation at the hands of the priests is whitewashed in church pamphlets and books such as Josemaria Salutan Luengo’s A history of the Philippines: A focus on the Christianization of Bohol (1521-1991) where Boholanos are presented as docile converts, eternally grateful to their missionary masters, a theme consistent with the glowing reports that Spanish priests sent back to Madrid. The reality was grimmer. The colonial practice of reducción (the containment of populations in artificial towns), coercive conversions, the arbitrary withholding of sacraments and the construction of churches as a form of taxation (recalled in oral history as a form of slave labour; see update below) regularly pushed the population to the limit. The Tamblot insurrection of 1621 was a shamanic backlash against Christianity in which rebels desecrated sacred imagery. The more famous and long-lived Dagohoy rebellion (1744–1829) was sparked by the refusal of a Spanish priest to grant a Christian burial to the brother of Francisco Sendrijas—although this was probably only a trigger for more serious grievances harboured by the wider population. Free from Spanish influence for 85 years, the Dagohoy insurgents built their own chapels and reinterpreted Christianity on their own terms, reviving pre-Hispanic funeral practises, animist rites and systems of social organisation. Shortly after the Bohol Republic ended in December 1901, the rebellious Iglesia Filipina Independiente (IFI) was founded in Luzon by Fr. Gregorio Aglipay, and missions reached Bohol the following year. Formally breaking with the Vatican, the movement achieved widespread popularity and in many parts of Luzon and Mindanao, converts soon outnumbered Catholics. Between 1902 and 1906, ‘Aglipayans’, as members of the new church were called, occupied the centuries-old Spanish churches. Since they had been built by forced Filipino labour (according to the activists), and since Spanish sovereignty had now been dissolved, Aglipayans argued that Catholic churches were were now the rightful property of Filipinos and not of Rome. In Bohol, the principle advocate for the Iglesia Filipina Independiente was Mariano Datahan, better known as the supremo of the Bisayan Declarado community of Biabas, Guindulman. Datahan spent his teenage years working in churches as a sacristan for several priests, before the revolution precipitated the evacuation of the Spanish clergy in 1898, so he was perhaps well placed to take advantage of the ecclesiastic power vacuum. 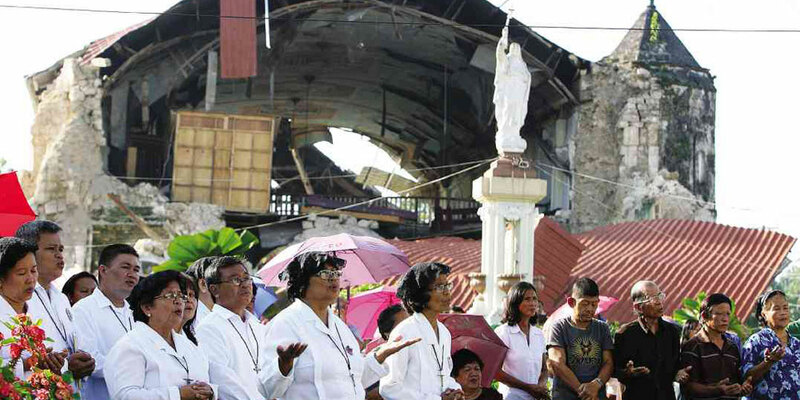 There is no recorded evidence that Datahan or his converts occupied Roman Catholic churches although local priests were desperate to curtail his growing influence in southeast Bohol, especially in the town of Candijay. Churches also figured prominently in Datahan’s symbolic repertoire. In the 1930s he dictated a series of stories that were transcribed by his followers, one of which recounted the exploits of the rebel Tamblot who, according to the tale, captured a bell from the church in Malabago (near Cortes) and hid it in the depths of the Abatan river to prevent the Spanish priests from taking it back. The Aglipayan movement in Bohol, and Datahan’s tales of native piety and heroism, point to a paradoxical desire to ‘own’ Christianity while rejecting the forces that brought it to the islands. According to local oral history, Datahan’s own parish church of Loon that he attended as a child and possibly worked in as a sacristan was built with forced labour, although this account is unlikely to be wholly accurate (see update). The church is much loved by the people of the town, a fact that is perhaps difficult to reconcile with its exploitative origins. A folk tale, collected by Maria Caseñas Pajo in the 1950s, provides a contrastive overlay to the darker alternative history. In this tale, the church’s origins are attributed to miraculous wealth. The legend goes that a woman by the name of Maria Loon was married to a poor fisherman. One day, her husband went off in his boat but fell asleep without catching any fish. To appease his wife he brought home handfuls of brightly coloured pebbles that he found in the shallow water. Maria Loon brought the pebbles to a jeweller in Manila who declared them to be precious stones. Thus it was that Maria Loon used her new-found wealth to construct the church, earning her the eternal gratitude of the people. 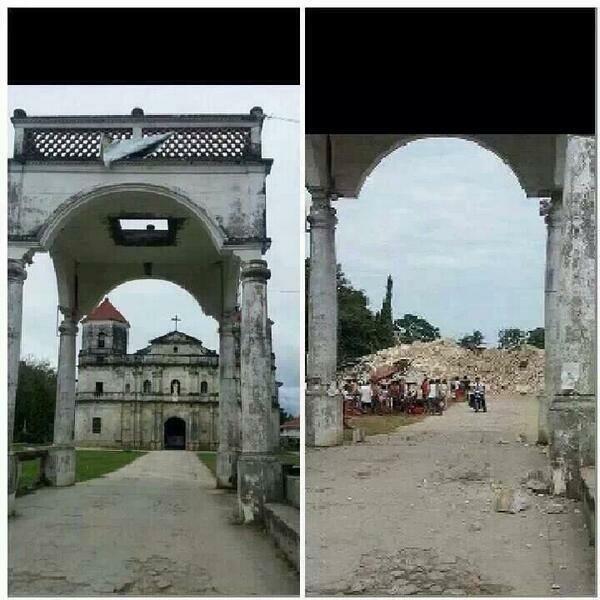 This church is now lying in ruins. 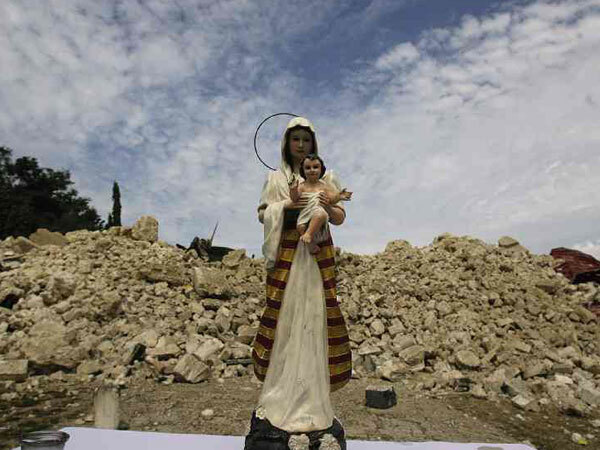 An individual died inside the building after it collapsed and two days ago a Mass was given at the ruins. I want to end by mentioning that Mariano Datahan, the rebel sacristan of Loon, had a series of powerful and calamitous visions in his later years. In one of these visions he saw an earthquake that shook the mountains of Bohol and from the rubble a golden church emerged. This was perhaps the clean-slate he had yearned for all his life. A church that was thoroughly Filipino, self-determined and untainted by colonial exploitation. A few years ago I spent some days in the Loon church, looking through records of baptisms to fill out genealogies. I remember that it had an ornate but airy interior that will never be restored even after the church is rebuilt. But at the very least its rebuilding will be done voluntarily and with a sense purpose and dignity. 1. The town’s name doesn’t come from a lady called Maria Loon, and the church was never built by her money; I doubt if she ever existed. 2. Mariano Datahan hid himself in the enclosure of Biabas, Guindulman together with a hundred wives and in the security of hundred more armed bodyguards during the WW II, and never led a single assault on the Japanese barracks in Poblacion Guindulman; 1st Lt. Bernido was brushed off when he asked Datahan’s assistance. 3. Only 1 person died inside the church when it collapsed. Unless a whole family died altogether, when no one else would look for them; there are no more people looking for their family member except for the one being dig and found. 1. No the town’s name doesn’t come from Maria Loon. Like the tale of the lost bell, that story is just a legend as I mentioned in the post. But I believe legends give us insight into the way people make sense of their lives so they are well worth analysing. 2. Mariano Datahan’s actions in WWII are not the focus of this article and I don’t wish to defend his record. Nonetheless, there is fairly solid documentary evidence that Datahan went to fight alongside Corporal William Knortz and Major Ernest McClish in Butuan in 1943 by which time he was already in his 70s. And yes, Bernido was brushed off by Datahan, but cooperation amongst all resistance groups in Bohol was always shaky, and Bernido himslef did not lead any assault on Guindulman either, as far as I’m aware. 3. Thank you for the up-to-date information. I had misinterpreted some photographed death certificates from Loon.